Bucharest, Cozia monastery, Sibiu, Hunyad Castle, Alba Iulia, Cluj Napoca, Targu Mures, Sighisoara, Biertan and Prejmer fortified churches, Brasov, Rasnov fortress, Bran castle, Peles Castle. Transylvania is the land of old ancient civilizations as Dacians and Romans, the medieval communities of Romanians, Hungarians and Germans, the place where the most important religions of Europe coexist peacefully since medieval times, where the most important architectural styles from Europe can be still seen. That why we can say that Transylvania is a mini Europe. Join us to discover more about Transylvanian history, culture, traditions and way of living. Meet your guide in the morning at your hotel or at the airport (for arrivals up to 11.00). Panoramic tour of Bucharest with the main points of interest like: Parliament Palace; Government Palace, Royal Palace, Revolution Square, Triumph Arch, Athenauem a.s.o. (only outside visits). Than start the route to Sibiu. In our way a stop for a visit at Cozia Monastery, erected by Mircea cel Bătrân in 1388 and boasting his tomb, is one of the most valuable monuments of national medieval art and architecture in Romania. The route to Sibiu cross the Carpathians Mountains through Olt River Valley. From the road the traveller can admire the beautiful show of the mountains. In the afternoon / evening we’ll arrive in Sibiu and we’ll make a city tour. 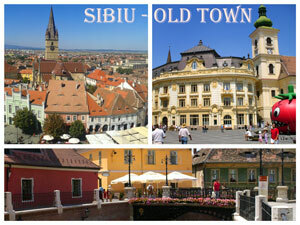 Sibiu is the biggest and oldest medieval city of Transylvania, built by the saxon settlers at the end of 12th century. The Big Square, the Small Square, the Catholic Church, The Orthodox Cathedral, The Eanghelic Cathedral, The staircase Tower, the Tanners Tower, the Liar’s Bridge , the House of the Butcher’s Guild and Bruckenthal Museum are the most important sights. Breakfast. Depart on the route to Hunedoara and visit the Hunyad’s Castle. The most representative castle in this part of Transylvania was built in 14th century and became famous as a property of Iancu of Hunedoara, the great ruller and fighter against the Ottoman Empire at that time. Next stop at Alba Iulia. Having its origins back in 2nd century from Roman time, the city of Alba Iulia offers a journey through the history of Transylvania from ancient times to medieval and modern days. We’ll visit the ruins of the Roman town, the medieval fortifications, the 18th fortifications made in Vauban style, the Cathoilc Cathedral, The Orthodox Cathedral, aso. le country. End the day in Cluj Napoca. One of the oldest and most important cities from Transylvania – the city of Cluj Napoca has the origins back in the Roman time, it was a former capital of Transylvania in Medieval period and a very prosperous city in late 19th century – early 20th century. From this period we have preserved the beautiful architecture and buildings which can be seen today. In the morning we’ll have a walking tour of Cluj Napoca. Next we’ll drive through an area with a high Hungarian influence due to the attested presence of the Hungarians settlments in Transylvania since 11th century. The most important city in this area is Targu Mures, where we will stop to have a Traditional Hungarian Lunch and to visit the central part of the city: Roses Square, Palace of Cultures, Ethnography Museum… We’ll end the day in Sighisoara. Option B - 3/ 4 stars pension in rural area. Today we’ll drive and we’ll visit an area with charming old villages, beautiful fortified churches which are the legacy of the German inhabitants which started to settle in Transylvania in 12th century. We’ll visit the unique fortified churches as Mosna or Biertan, local craftsmen which try to preserve the old workshop and tools. Lunch will be served with traditional food of the area. In the afternoon we’ll visit the medieval citadel of Sighisoara, one of the most preserved medieval towns from Europe. Breakfast. Start on the route to Brasov. One can admire from the road the arhitecture of saxon’s villages, the fortresses from Rupea, Saschiz and Rotbav. The next stop will be at Prejmer. Visit Prejmer Fortified Church, one of the best preserved of its kind in Eastern Europe. The church is modeled after churches of Jerusalem, as well as built in the style of Late Gothic churches from the Rhineland. 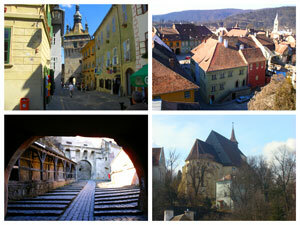 End the day in Brasov / Brasov area with a visit in the Old City Center. 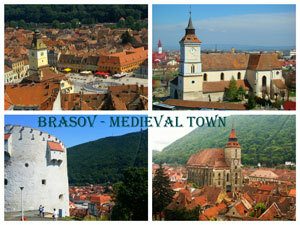 Brasov is an old and important medieval town dating since 13th century. Main atractions are: Black Church.- a major symbol of Braşov, and a museum open to visitors of the city center, Weaver’s Bastion, Black and White Towers, Ecaterina’s Gate, Concil Square. Breakfast. Next stop at Rasnov and visit the old citadel. Built in 1331, the Fortress had a defence role and it was a shelter for the inhabitants of Rasnov in case of enemy attacks. 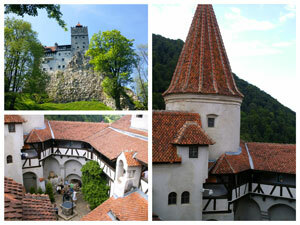 Continue our visit at Bran with it’s famous Bran castle. Also called Dracula`s Castle, which got its fame from Dracula`s legend written in 1897 by Bram Stoker and later on made into a film by Francis Ford Coppola. The first documents about the Bran Castle appeared in 1377. In the afternoon we’ll spend couple hours in Bran village area to learn more about the traditional life in a Romanian mountain village. Visit at a traditional loom with live demonstration of use. Tour of the village in horse driven carriage. Cheese tasting and Traditional meal with local Romanian foods. (includes 1 beer or 1 glass of wine per person). - Visit at the Cabane Aux Images, a photografic exhibition about rural life in Romania. Possibility of visiting an ”odaie”, traditional stable with hay and cows (visitors must hike to arrive to the odaie). Along the entire tour you’ll find more about the Romanians old history, traditions and about their ancestors the Dacians and the Romans and many other interesting things about this area and its people. 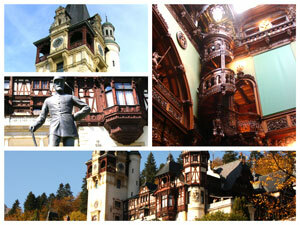 In the morning depart to Sinaia and visit the Peles Castle, former summer residence of the kings of Romania. Nowadays the Castle is one of the most important museums in Transylvania where one can admire furniture and ornamental objects, carpets, tapestry, sculptures, paintings, collections of weapons from the 15th up to the19th centuries. 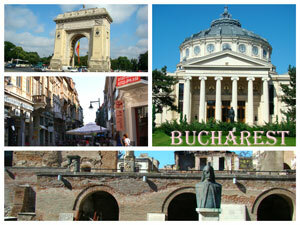 Arrive in Bucharest (aprox 13.00 hrs). Drop-off at the airport or at a hotel in Bucharest. 6 nights accommodation; Meals as specified (daily breakfast, 3 lunches); transport with car or minibus; local guide. English language; Entrance tickets Lunch, cheese tasting and Tour of the village in horse driven carriage in Bran area, Local taxes. Other services not specified on the itinerary. Photo/video fees. Other meals not mentiones as included. Personal expenses. Banking or e-payment fees. At request we can customize this tour according to your wishes. 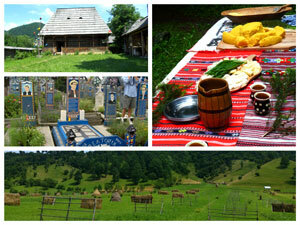 Why to book Transylvania History and Traditions tour? It was one of the most comprehensive tours to Transylvania. In 7 days journey you’ll discover the best of Transylvania, you’ll find more informations about its history, culture, traditions and legends. Transylvania it is the biggest and the most popular region of Romania and most of the tours to Romania include some of the Transylvanian highlights. Travelers can visit beautiful old medieval towns, castles and fortresses, old churches, well preserved villages. You’ll be delighted by the nice scenery of the Carpathians mountains, of Transylvanian green hills, lakes and many more. Other highlights are the charming old villages. In south of Transylvania most villages preserve very well the Saxon (German) heritage, including old architecture, customs and way of living. In our Transylvania tour you can visit the Saxon fortified churches, unique in the World due to their architecture and role in Transylvanian history. In the mountains area you’ll see the mountain villages architecture, places built by the old shepherds and adapted to their landscape and conditions. 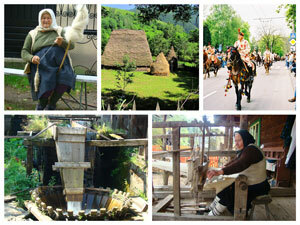 The traditional life and local food are a part of our tour to Transylvania. We’ll start our trip from Bucharest, because it is the most important airport, but on request we can design a customized tour in Transylvania, starting and ending in a different city as Cluj Napoca, Sibiu, Brasov (arrival by train). Many legends and stories are about Transylvania. Our tour guide will explain the real facts and what is fiction about them. Taste the Transylvanian cuisine, influenced by the three main cultures in the area: Romanians, Hungarians and Germans. The tasty natural products are a highlight of your Transylvania tour. Traveling in Transylvania will be a nice experience for you and it is a great choice for your holiday. 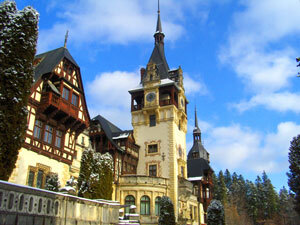 We are inviting you to join this tour in Transylvania and to discover this part of Europe. 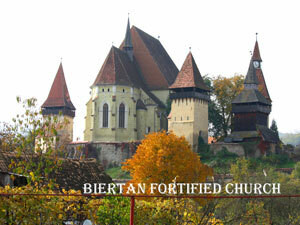 You can visit our Transylvania tours category for more options.